The link that brought you to this page and the page title are a bit of a misnomer, because this short report is not long enough to cover so many chapters of the Bible. What the link and the title do, however, is track where we are in our plan to read through the entire Bible in 1 year. May each report pique your interest and help you to draw near to God. The Bible, James 4:8, tells us if we do so God will draw near to us. A chart follows the report. Works cited follows the report and a screenshot of the ESV/YLT/AMP Bible, in parallel, is at the end. Internal links provide additional information. ​BIBLE READING—3RD WEEK—GEN 43-EX 12: In this and last week’s readings we transitioned from the patriarchs to a young Hebrew nation that soon became “exceedingly mighty” (Ex 1:7). Because of their numbers, a Pharaoh that didn’t know Joseph oppressed them and used the Hebrews as slaves and he commanded that if a newborn Hebrew was a male child that the child would be killed at birth (1:16). But God preserved Moses, who was adopted and raised as a member of Pharaoh’s house and used him to led the Hebrews out of Egypt. This week’s Short Report will look at the events surrounding the ten plagues, or judgements, God used to free the Hebrews from Egyptian slavery, whereby He set the record straight—there is but one God—the God of Abraham, Isaac, and Jacob (Israel). 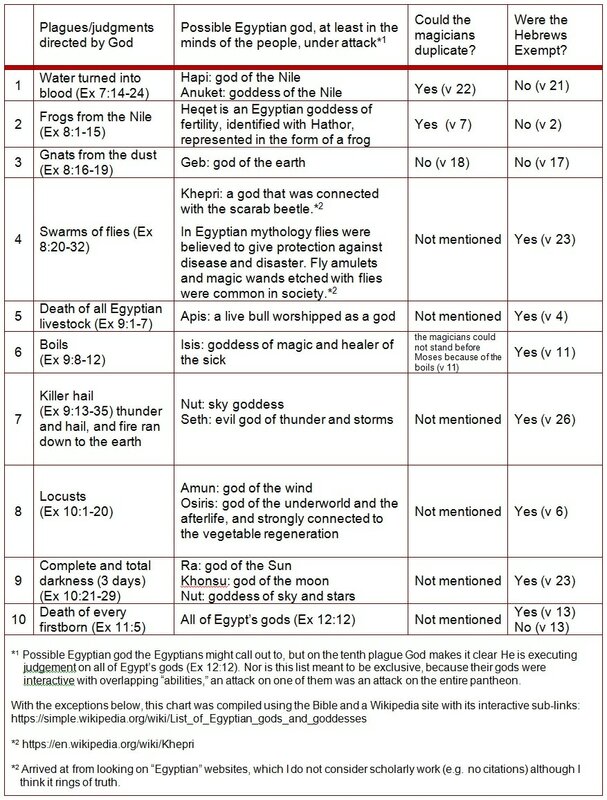 I also provided a chart of the plagues featuring the Egyptian gods and additional information. But first, before leaving Genesis behind us, a key verse: Genesis 50:20 says, “As for you, you meant evil against me, but God meant it for good, to bring it about that many people should be kept alive, as they are today.” With that and the following verse Joseph reassures his brothers he would not harm them although they gave him good reason to after they set out to murder him, but ended up selling him into slavery. The Holman Christian Standard Bible makes a great comment here: “God had transformed the soot of human sin into a diamond of divine blessing (Rm 8:28; 1Pt 2:24). Far from being embittered, Joseph was emboldened to take care of the very ones who had tried to kill him, along with their little ones. He spoke kindly to them (lit “spoke upon their heart”; cp. Is 40:2) and comforted them.” To that I would add how appropriate it is to have this verse at the end of Genesis to remind us that God is totally in control. After God made the earth and everything in it man rebelled against God and sinned and so sin entered the world. But even in a sinful world God works His good will above the will of man, when necessary, to provide mankind a Savior. In the words of Don Moen, “God will make a way where there seems to be no way.” And how interesting that Judah was the one that suggested selling Joseph to a caravan heading to Egypt where, by God’s hand, Joseph was able to keep many alive during the seven year drought, including Judah an ancestor of David and of Jesus, who was a Son of David. While we move from Genesis to Exodus with the turn of a page, H.H. Halley tells his readers there was about a 300 year gap from Joseph’s death to Moses’ birth and a full 430 years from the time Joseph first went into Egypt and the Exodus when the Hebrew Nation gained their freedom (p. 109). God had been silent a long time, and He broke the silence with a loud roar! That roar caused Pharaoh to ask the question, “Who is the Lord, that I should obey his voice and let Israel go?" (Ex 5:2)The Egyptian’s had a pantheon of gods and to the Egyptians Pharaoh was a god. Wikipedia explains it this way: “The pharaoh as Horus in life became the pharaoh as Osiris in death, where he was united with the rest of the gods. New incarnations of Horus succeeded the deceased pharaoh on earth in the form of new pharaohs” (wikipedia.org/wiki/Horus). While the Wikipedia site I used to gather information held 52 Egyptian gods, Lessing and Steinmann inform us the “Egyptians worshiped over eighty gods and goddesses” (p. 85). It’s also interesting to note that many Bible scholars believe the events took approximately nine months. That’s based on the seven days between the first and second plagues, the condition of the flax and barley mentioned in the seventh plague, which puts the month as February, and the tenth plague, which took place on the Hebrew calendar in the month of Abib, our April (Wendland, 49). So Pharaoh, a god, with a small army of gods, set his rebellious heart on overcoming the Lord God Almighty (Adoni El Shaddi). Many of us will remember that God told Moses He would harden Pharaoh’s heart (Ex 4:21), but He did not do so until Exodus 9:12, after Pharaoh first hardened his own heart at Exodus 7:22. Lessing and Steinmann speak on the hard heart subject in Prepare the Way of the Lord saying, “There comes a point when God seals the fate of this oppressor and makes his fall from power inevitable. It is as if God is saying to the king, ‘If that is how you want it, I’ll help you along the way’” (pp. 84-85). God started the process slowly with a simple miracle of turning a walking stick into a serpent, but the magicians of Egypt were able to duplicate that sign. Even so, “Aaron's staff swallowed up their staffs” (Ex 7:12). The ten plagues followed. As my chart shows, the magicians of Egypt could only replicate the first two judgements, and the Egyptians, like all of their gods were subject to all of God’s judgments; in contrast, the Hebrews were exempt from the plagues after the third plague and were safe through the ninth plague. It would seem that God was using these less harmful plagues for their shock factor to prepare the Hebrews for the march out of Egypt. Once He had their attention, there was no need to plague them with additional judgements. Moreover, the exemption, or “division” (Ex 8:23) made it clear to all that the Hebrews were under God’s protection and the plagues were under His control. For the Hebrews, however, protection from the tenth plague was conditional—all who participated in the first Passover (no doubt all of them) were redeemed by the blood of the sacrificial lamb, which pointed forward to Christ, the Lamb of God, and spared each household from judgement—death of the every firstborn in all of the land of Egypt (Ex 12:13; Num 9:12; Mt 26:2; 1 Pet 1:18-9). Before I finish, I must point out the use of the word fly, or flies is not in the original text in Exodus 8, the word in Hebrew is עָרֹב (‘ârôḇ), which indicates, according to Strong’s numbering system (h6157) “a swarm or incessant or involved motion.” Most modern versions of the Bible translate עָרֹב as flies just like most of the older versions did. 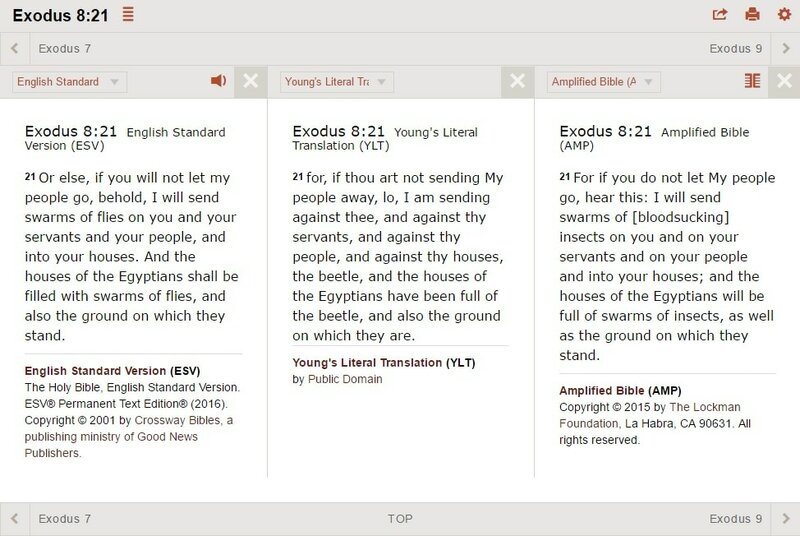 However, I did find an older version, Young’s Literal Translation (1898), which uses beetle in its text, and a newer, updated version of the Amplified Bible (2015) that applies the term “[blood sucking] insects” rather than flies (see screenshot at bottom). Big word alert! (Because Zondervan uses it) Phlebotomist, as in phlebotomistic insect, is the act or practice of opening a vein for letting or drawing blood. The Zondervan Pictorial Encyclopedia of the Bible holds a similar position on the use of the word fly. While it acknowledges it could be a type of fly (perhaps the blood sucking gadfly), it also indicates it could be “some sort of phlebotomistic insect. The etymology of this term is not clear, since there are many homophonic words” (vol 4, p. 806). A mosquito, or in this case a swarm of mosquitoes, which are blood sucking insects could also fit the picture. On the other hand, blood was not in the original term as defined by Strong’s number system (h6157) only a swarm or incessant or involved motion. So beetle could fit the picture just as many insects could. This may fit the picture best, because the beetle was deified by the Egyptians in the form of Khepri, a sun god who was connected with the scarab beetle. I’m not an expert in Egyptian mythology, so I won’t make the call, except to say it doesn’t matter in the big picture exactly how God enacted the fourth plague since the Bible makes clear that God did. I only mention it in the first place to explain what you see on the chart. Secondly, it helps to make everyone’s knowledge a little more complete. Wendland, Ernst, H., Exodus - People's Bible Commentary. Concordia Publishing House, 1992. Wikipedia, the free encyclopedia, Khepri. Wikipedia, the free encyclopedia, List of Egyptian gods and goddesses. Zondervan Pictorial Encyclopedia of the Bible (5 Volume Set), The. Merrill C. Tenney (Gen. ed.). Zondervan, 1975.